Easter Dinner…What’s On Your Menu? Easter is not one of those holidays where you can count on certain weather–especially not in upstate New York. Maybe this is why I don’t look forward to it like I used to as a child–Easter dresses and bonnets, no winter coats, sun shining and windows open. I do know what hasn’t changed, my love for cooking on a holiday, even if it’s not my favorite. Easter dinner is what’s on the menu right now. The star of my Easter dinner is, of course, the ham. Oh, how I look forward to a huge ham for Easter. Traditionally, pineapple, cloves, with a cherry in a the middle was a way to dress up the ham and cook it. The flavoring was impeccable, but I chose a simple glaze that will give ton of flavor. Brown sugar, Dijon mustard and a little honey to top it off. Whisk and brush over the ham, I usually start glazing the last 30 minutes of cooking. My stomach is growling already. 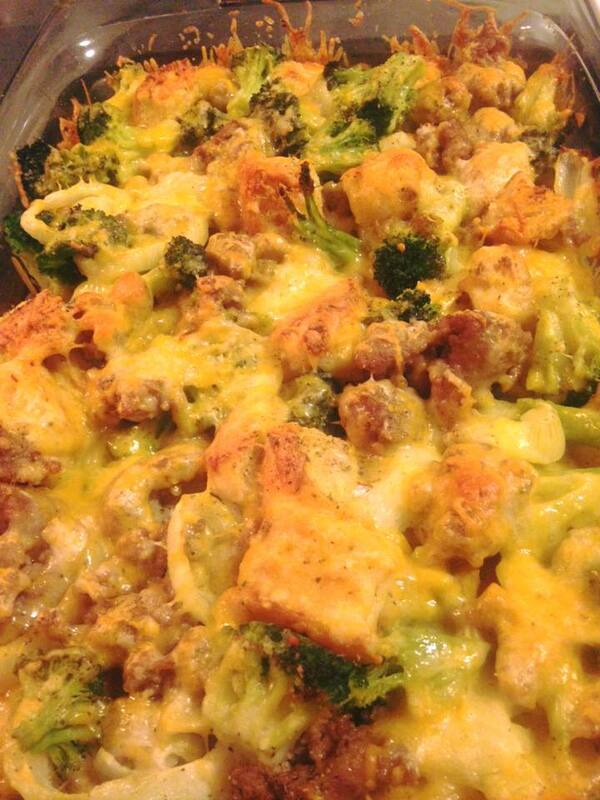 It’s easy to get carried away with many and varied side dishes for your ham, but if you are looking for something simple and just for maybe the two of you, I suggest going for Sausage and Broccoli Casserole. Not every day do you have a casserole that knocks you off your feet. Even though it could be a little heavy for your traditional Easter dinner, this dish will pair delightfully with only ham. I roasted the broccoli and onions before adding them into the casserole, which helps bring out the flavor of the broccoli and sweetness of the onion. It’s a cheesy goodness! The best part of the casserole is if you choose to make this for dinner after Easter, use the leftover ham, chop it up and throw it right into the casserole. One pot meal. Delicious. A great recipe used for a side dish or a meal all by itself.